As we approach the last week of Living Red, we have been encouraged and challenged to re-examine how we perceive the marginalized and to move toward changing the lives of those we meet along the way, and in turn be changed ourselves. The Living Red Prayer Guide profiled 40 organizations where we can help, and each Sunday we’ve profiled two local organizations during our services. Along the way, we’ve also been highlighting specific books related to living a faith that bleeds. Amazon.ca—If we are completely honest, all of us have places, situations, and people whom we would rather avoid. Yet in a world that was governed strictly by geographical, religious, and social barriers, Jesus was audacious enough to cross the borders that kept people in safe categories. He demonstrated that the God-following life is one committed to entering the lives and stories of all people—a life committed to the lost spiritual discipline of border-crossing. 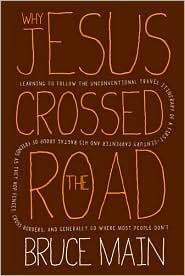 In Why Jesus Crossed the Road, Bruce Main shows how God can use your own “crossings” to change your life, and the lives of those you meet along the way.